I love summer, hosting outdoor events, playing with my kiddos outside, but I HATE bothersome bugs, which always seem to ruin a great time! Thanks to the Dynatrap DT1100 Insect Trap we can now enjoy ourselves outdoors without having to worry about pesky bugs biting my babies or me! Isn't that just wonderful, and I thought the video could explain it way better than I could! But as soon as my husband and I opened the box and "tried" it out my husband looked at me and said "this is like a futuristic way advanced bug trapper" and I couldn't agree more the days of yucky bug sprays/poisons and ugly dangerous zappers are long gone and the DYNATRAP is the latest and greatest! covers up to ½ acre (or a 1000 sq. foot room). 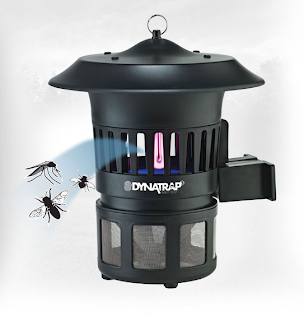 Unlike an ugly bug zapper, the DYNATRAP is very quiet and We don't even notice that it is even on, other than the lack of bugs that's pretty noticeable but in a GOOD way! Optional ways to install the DT1100 , Built in mounting system, included chain to hang it on or you could sit it on a table or etc easily! while it's doing it's job and providing us protection from mosquitoes and other pesky bugs. Overall I love our DYNATRAP DT1100, we used it yesterday at a small party we had and it worked wonderfully the kids were playing in the backyard and I plugged the DT1100 in and never once had any Bug problems and they were for once able to play outside well past dark without being bitten or etc. I plan on using this Wonderful wonderful Bug Trap constantly! I would love to get one of these we have a real bad bug problem. We get bit as soon as we walk out the door. Thank you for the review. I have pantry moths. This would be great on those. It says you can use it in a 1000 sq. foot room, so I assume it's fine for indoor use-- some of them aren't.